Combine the lemon juice with the oil and salt. 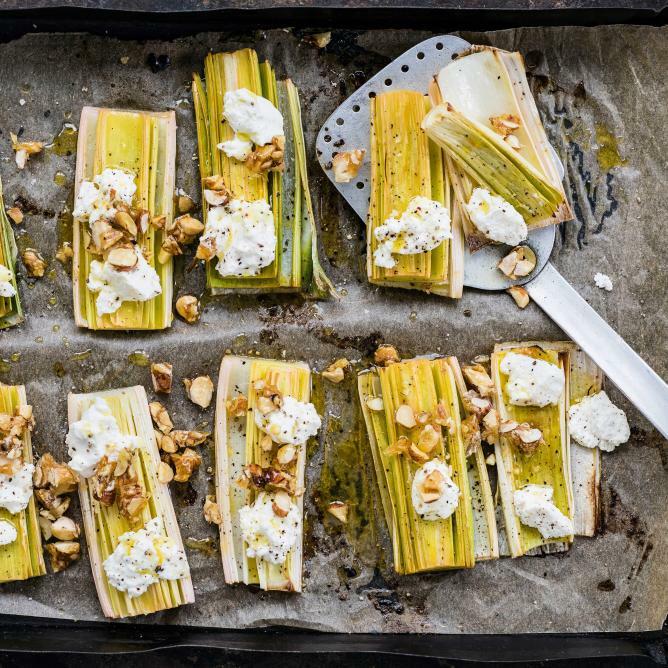 Place the leek on a baking tray lined with baking paper, drizzle with half of the vinaigrette. Approx. 10 mins. in the upper half of an oven preheated to 200°C. Spread the ricotta over the leek and bake for a further 5 mins. Boil the sugar and water in a pan without stirring. Reduce the heat and simmer, swirling the pan occasionally until a light brown caramel has formed. Add the nuts, mix and transfer to a sheet of baking paper, leave to cool. Roughly chop the caramelized nuts, scatter on top of the leek, drizzle with the remainder of the vinaigrette.